A Los Angeles Fire Department helicopter is towed after a mishap at the La Tuna Fire on September 2, 2017. 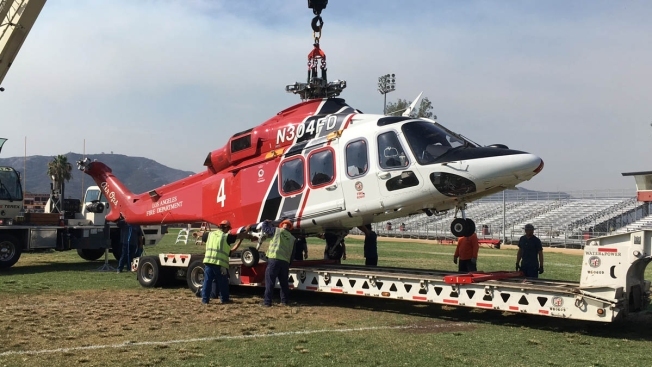 A $17 million firefighting helicopter damaged during the La Tuna Fire a year ago has been returned to service and the Los Angeles Fire Department says its fleet of aircraft is now fully prepared for the peak of the brush fire season. LAFD’s "Fire 4," an Agusta-Westland AW-139, had part of its tail torn away, its fuselage damaged, and the tip of a main rotor blade broken-off during the mishap on Sept. 2, 2017, when the pilot said he experienced a sudden loss of control during a water drop, according to federal accident investigation documents obtained by NBC4. The LAFD pilot, Lance Messner, said it happened during the 5th or 6th water drop of the day, and said he immediately released the approximate 1-ton of water in the tank mounted to the belly of the aircraft. 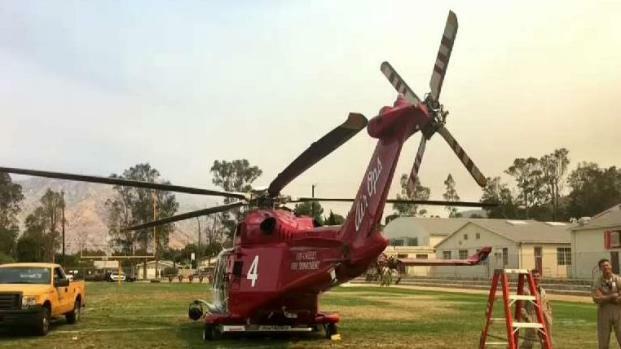 A Los Angeles Fire Department helicopter is back in service after extensive repairs even as the cause of the mishap that caused the damage remains under investigation. Eric Leonard reports for NBC4 News Aug. 31, 2018. "This action exacerbated the yaw," the FAA report said. "Pilot then increased power, but the aircraft didn’t respond instantly. The PIC [pilot in command] couldn't avoid striking two trees near the fire location with the main rotor blades and underside of the aircraft." Messner landed the damaged helicopter at Verdugo Hills High School and was not hurt. Photos taken after the emergency landing and provided to NBC4 by the FAA in response to a Freedom of Information Act request show branches embedded in parts of the helicopter, a hole in the tail where one horizontal stabilizer was torn away, and damage to the second horizontal stabilizer. An LAFD spokesman said he could not discuss the accident because it is still under investigation and the NTSB has not released a final report identifying the likely cause. A federal official familiar with the accident probe told NBC4 mechanical problems with the helicopter or its engine have been ruled out. Fire 4 was out of service until July 2018 and repairs cost approximately $3.5 million, which was covered by insurance, the city said. The helicopter was delivered new to LAFD about a month before the La Tuna Fire and it had flown only 150 hours when the accident happened, according to records. Earlier in 2017, members of the LA City Council had expressed concern about the readiness of the LAFD fleet after half of its water-dropping helicopters were grounded for maintenance when two brush fires started on the same day in Sylmar and Mandeville Canyon. Helicopters from LA County were called to assist and the fires May 28 were extinguished without injury or property damage, city officials said. "When we are down that low, that freaks me out," City Councilman Mike Bonin said at a committee meeting in June when the helicopter fleet's availability was discussed. In response in 2018 the city approved the purchase of another AW-139 and said it planned to increase the availability of helicopter mechanics. The new helicopter is expected to arrive in spring 2019. LAFD said it has four water dropping helicopters and three were available for response Friday. 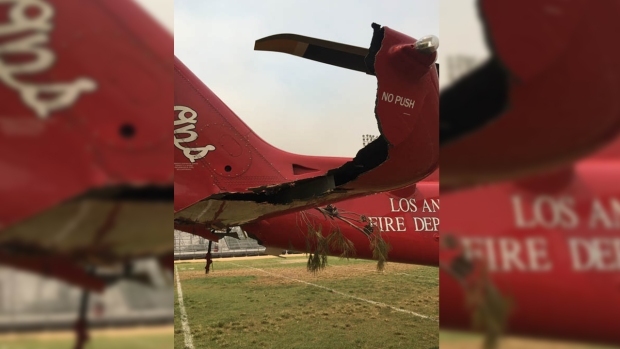 During the La Tuna fire, a Los Angeles Fire Department helicopter had to make an emergency landing onto a high school football field and the department has released very few details about the chopper's landing. Joel Grover reports for the NBC4 News at 5 on Wednesday, Sept. 6, 2017. In addition, a contract Sky Crane water-dropping helicopter went on standby at Van Nuys Airport Aug. 1 for brush fires in the city, and LAFD has a mutual aid agreement with the county for use of its contract Sky Crane and two SuperScooper water-dropping airplanes in the event of a major emergency. 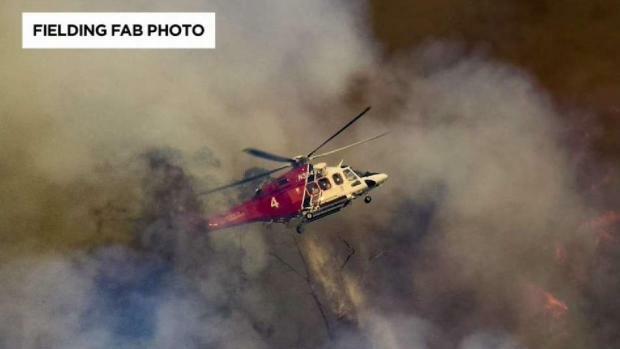 NBC4 was first to report on the Fire 4 incident last year after a viewer provided a photo that appeared to show the helicopter impacting trees at the La Tuna Fire.